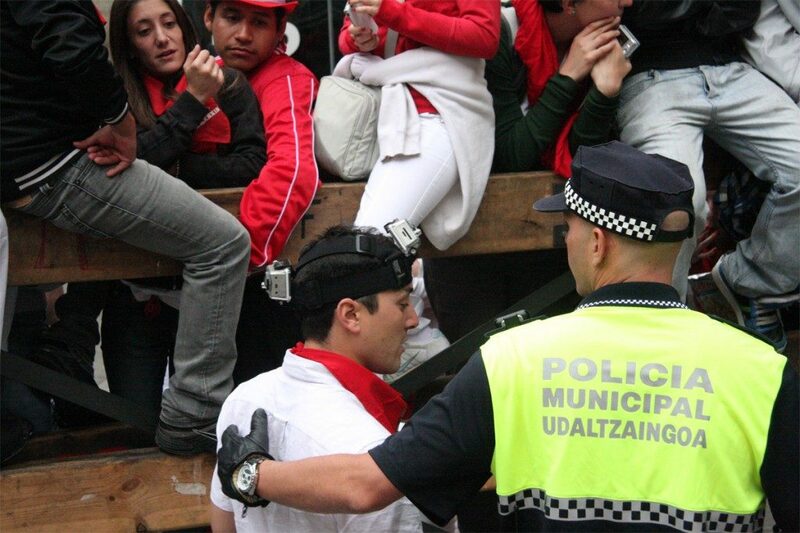 Pamplona City Hall, which is responsible for organizing the Running of the Bulls event, and ensuring its safe outcome, each year publishes a bye-law which outlines in detail all that is permitted and prohibited to those who take part in the event. Fines are listed for different misdemeanors committed in the course of the event. It is important to be aware of these norms, as there are always some fines issued to runners who have broken the rules, and on some occasions, some of these runners have been totally unaware of the existence of the prohibition. It is worth taking the time to check the “dos and don’ts” about behavior on the course. 1.- To admit anyone under the age of 18 into the course as minors are totally prohibited from running or participating. 2.- To go over the police barriers which the authorities see fit to erect. 3.- To place oneself in the zones and areas of the itinerary which are expressly reserved by the agents of the authorities. 4.- To hide oneself before the release of the bulls in corners, dead angles or doorways of houses or establishments located throughout the length of the course. 5.- To leave open the doors of the houses along the course, the owners or tenants of the said property being responsible for this. 6.- To enter into the route in a state of drunkenness, under the effects of drugs or in any inappropriate state. 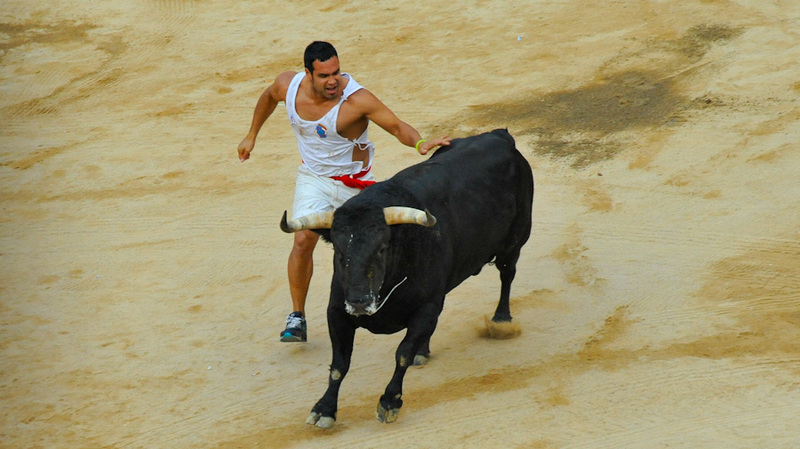 7.- To carry objects which may impede the correct running of the Bull Run. 8.- To wear clothes or shoes which are not appropriate for the run. 9.- Call the animals or distract them in any way and for whatever reason in the course or during the rounding up in the Bull Ring. 10.- To run at the bulls or to run behind the bulls. 11.- To touch, to harass or mistreat the bulls and to obstruct their path by any kind of action during the exit and entrance of the release of the young bulls in the bullring. 12.- To stop in the Bull Run or station oneself on the walls or barriers or in the doorways in such a way as to impede the run or the defence of the runners. 13.- To take snapshots from inside the route or from the fencing or barriers. 14.- To carry troublesome paraphernalia that could upset the proper execution of the running of the bulls. 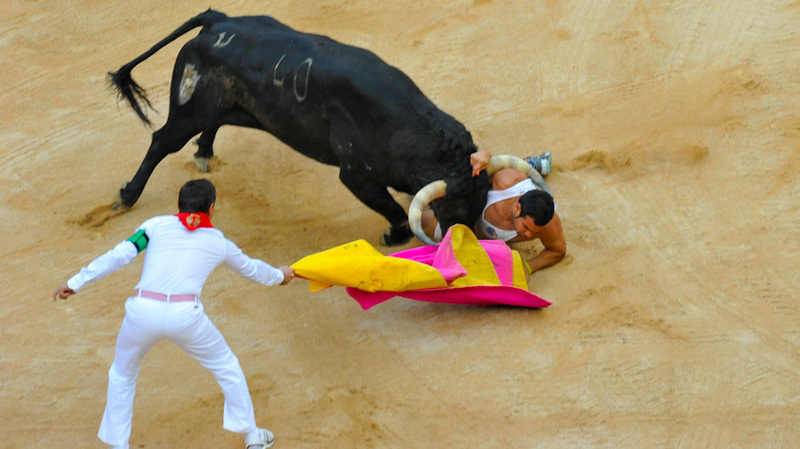 15.- To install any kind of equipment that invades the horizontal, vertical or special area of the bull-running, except by express permission of the City Hall. 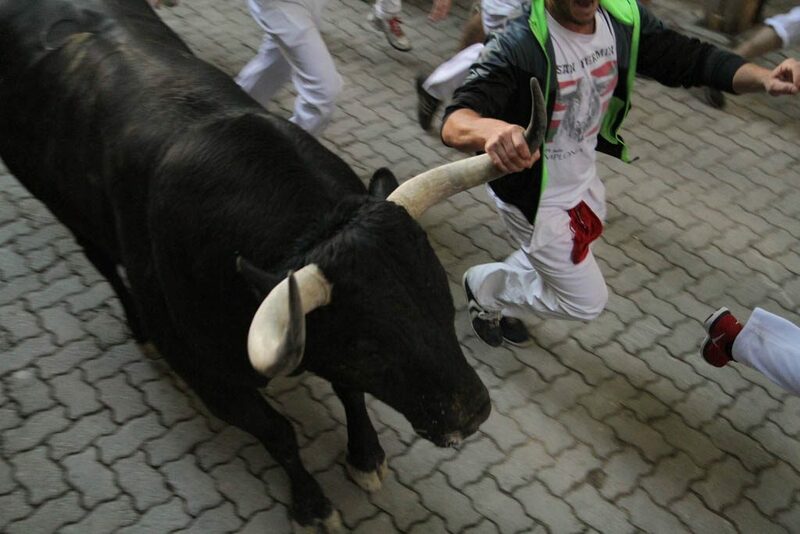 16.- Any other kind of occurrence that could hinder the normal functioning of the running of the bulls. So, now you should be somewhat better prepared to do the run. Do you still fancy the idea? Or does it all sound too complicated? Remember that all this advice is just to make sure you are not going to be a disturbance to the other runners or indeed to the bulls during the run. The most important iadvices are two: not to disturb the rest of the runners and don’t call the animals or distract them. And the last piece of advice is simply to remember the fact that the runners are taking their life in their hands when they run. Should you put their lives in danger through some stupidity of yours, then you are only going to give yourself problems.